The Qassam attacks emanating from north Gaza are continuing despite talks of a possible hudna (ceasefire) with Israel. Three rockets fired Thursday morning from the Strip landed in open fields near the western Negev city of Sderot, while another Qassam landed earlier just south of Ashkelon. One of the Qassams landed near a schoolyard in Sderot, causing several people to suffer shock and slightly damaging the surrounding buildings. "We heard the 'Color Red' alert and then there was a loud boom. We figured a rocket landed close by. A lot of the kids were frightened," Ofek Vaknin, a sixth grader at Sderot's Gil Elementary School, told Ynet. Soon after, many parents arrived at the school and took their children home. The Sderot Municipality is currently assessing the damage caused to the school's building in order to determine whether or not the school day will go on as scheduled. The Popular Resistance Committees' (PRC) Salah a-Din Brigades, have claimed responsibility for the shooting. The rocket fire on Israel has decreased in the past few days due to multiple IDF attacks against Islamic Jihad terror leaders. On Wednesday Hamas Prime Minister Ismail Haniyeh suggested the possibility of declaring a ceasefire with Israel, but the proposal was rejected by his government. President Shimon Peres said Haniyeh's suggestion was "a pathetic attempt at diverting attention from Hamas and Islamic Jihad's crimes." On Tuesday Prime Minister Ehud Olmert said, "All those responsible for the firing (of Qassams and mortar shells) on our communities – we will reach them. "The actions will speak for themselves, and the heads of the terror groups will feel them," he told fellow Kadima party members at his official residence in Jerusalem. 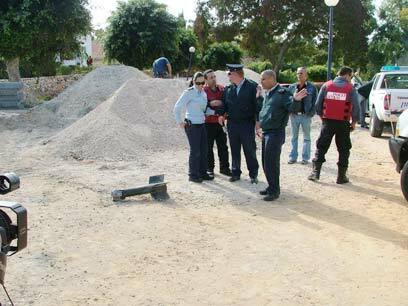 See all talkbacks "Qassam lands near Sderot schoolyard"